Savannah’s most famous moment in American history came at the end of Sherman’s March through the Confederate south and to the sea. By the time he got there, in December of 1864, Union forces had captured the areas around the city. Sherman sent a letter to the Confederate general commanding Savannah, William Hardee, demanding surrender. Hardee and his troops fled instead. The mayor of Savannah — left with no other choice, I imagine — offered Sherman a deal: the city’s surrender in exchange for protection of her citizens and property. Sherman accepted. Sherman wasn’t the first to capture Savannah, however. Long before the Civil War, the Revolutionary War had also come to Savannah. The British invaded and took Savannah in the First Battle of Savannah on December 29, 1778 and Colonial troops tried and failed to take it back in the Second Battle of Savannah the following year. 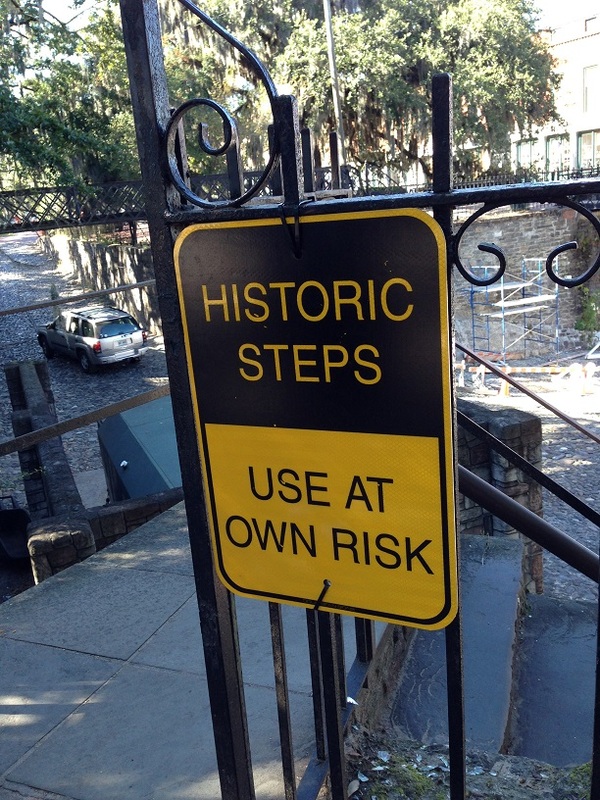 Savannah remained under British control until they evacuated in July 1782. 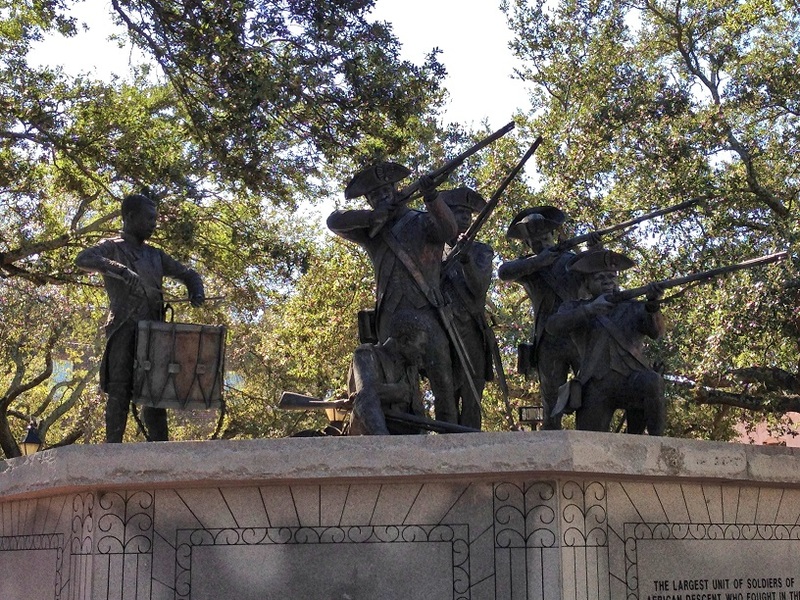 In the middle of Franklin Square is a monument to the 500 Haitians who joined Colonial and French troops to fight the British during the second battle. The Chasseurs Volontiaires de Saint-Domingue, who were gens de couleur libre, were the largest contingent of men of African descent to fight in the American Revolution. As I said, almost every square in downtown Savannah had a monument, or a historic building next to it, or something that would make us stop and stare. Eventually, though, we made it to the Savannah River, with its banks lined with warehouses-turned-shops and hotels. We did a little window shopping but by then it was late afternoon and we were exhausted, so we headed back to the visitor center. 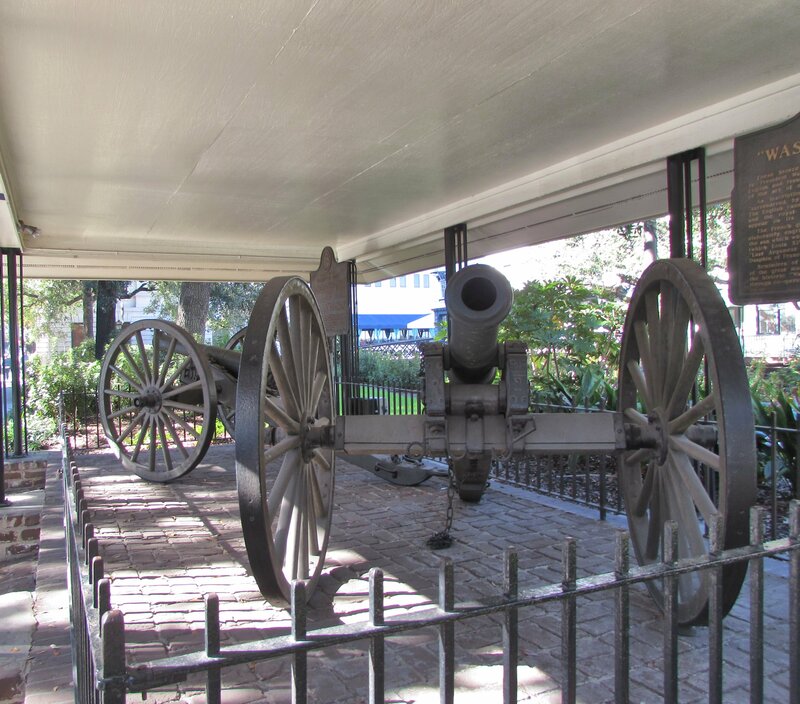 On the way, we came across a pair of cannons that George Washington had given the city of Savannah when he visited on his Southern Tour in 1791. The city has named them George and Martha. I’m not sure which is which. We made it back to the visitor center around 4, giving us an hour to see the Savannah Museum of History, which is attached to the visitor center. You knew I couldn’t leave Savannah without seeing at least one museum, right? It was quite small, but packed full of interesting objects. The dress in the first photo is from the museum. 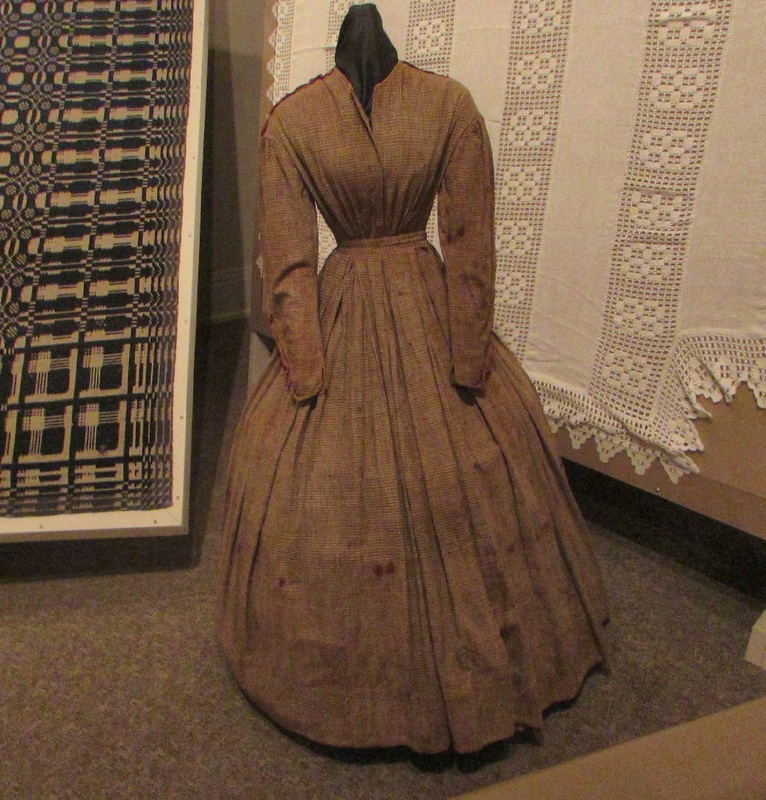 Made by a woman on her cotton plantation, it was part of an exhibit on how people had to adapt when southern ports were blockaded during the Civil War. She spun the cotton into thread, dyed it, wove it into cloth, then sewed it into a dress. I guess it was remarkable because, while someone always had to do those things, pre-war, it wouldn’t have been her. On previous visits, I remember loving the Telfair Academy museum, especially the Regency building that housed it. And the creepy, moss-covered Bonaventure Cemetery, aka the Garden of Good and Evil. And the Juliette Lowe House which, for a former girl scout (I made it as far as the first year of Cadettes), is practically a shrine. This time, we were in Savannah for about 7 hours: long enough to walk the historic area, have lunch, and spend 45 minutes in the history museum. Next time, we’ll definitely make it longer. Nice post – I like the monument picture. I need to know more about the War of Independence so must find a good book. I think that “1776” by David McCullough is the new “definitive” American Revolution book. I haven’t read it yet, but mean to eventually.